An Old Man sits and carefully unwraps a sandwich on a park bench. TEENAGER (RYAN), showing signs of limited physicality. She and her CAREGIVER play with energy. RYAN wears pin, backpack. OLD MAN watches. In early 2013, Steve and Zoë teamed up to create a groundbreaking theatre production that inspired the formation of RocketHouse – MINDFIRE: the world’s first parkour play. Focusing on the concepts of mental health and normative vs alternative reality, the play was based on the true stories of friends and family with variations of Alzheimer’s, dementia, autism, and Rubinstein–Taybi syndrome. The action and characterization were expressed through acrobatics and parkour, film projection, wearable technology, and played with the genres of cartoon, silent movies, and steampunk to reflect the distinct and blended experiences of each character. 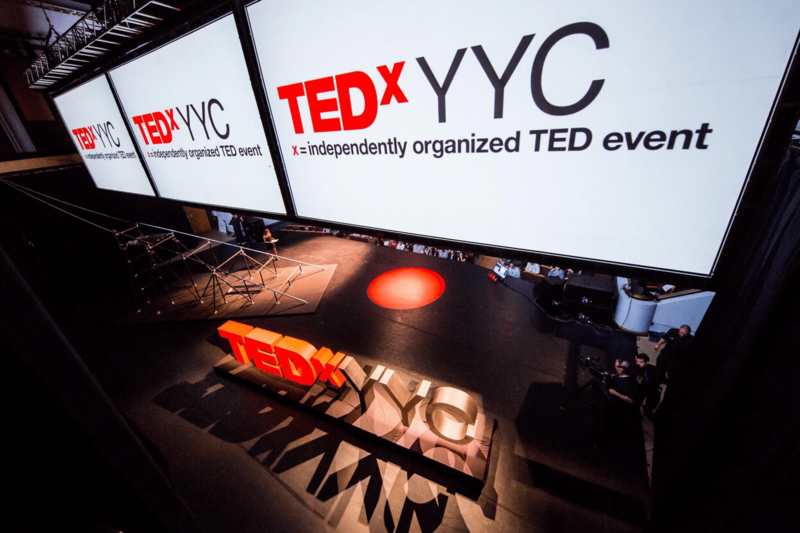 TEDxYYC approached RocketHouse in to create a 5-minute live trailer version of MINDFIRE as an inaugural artist-in-residence creation for their 2016 conference. The new railroad-inspired scaffolding structure was commissioned as the TEDxYYC Legacy Set and was featured on stage during the full day of talks. This performance is dedicated to our beloved Al Stickel. We are eternally grateful for his sacrifice while bringing this show, and the character of Jack, to life – showing up for rehearsals directly after undergoing chemotherapy and staying late to help clean up. He is the best and bravest man we have ever known and we miss him dearly. An old man sits on a park bench tracing through fragmented memories in search of his long lost wife. A villain appears: malevolent, moustachioed; the man who must have stolen her away. In desperate repetition, the old man attempts to rescue her from the darkening wastes of his deteriorating mind. But only in pairing up with the superheroes that dwell in the imagination of an enigmatic young girl can the old man realize the power to recapture a moment with his wife and find peace in reality. Mental health was our inspiration, but not as an attempt to explain away symptoms nor strive to apologize for them. Our personal stories of Alzheimer’s, autism, and RTS compelled us to highlight the power of non-normative mental conditions. Our playwright, Tom Currie, used each character’s version of reality as an encapsulated world and Artistic Director, Zoë Klintberg, brought those to life through projection mapping, lighting, choreography, and soundscapes. We open on a regular landscape—normative colours and sounds—but see those shift to sepia tone, film grain, waltzes, and muffled, repeated sounds when seen through Jack, the old man’s, eyes. For Ryan, the young autistic girl, we see the hyper colour reality of a graphic novel. attributes and powers to each point of the plot. They function as a skin on top of the normative reality so that if you were a viewer with the power of accessing each character’s perception, you could blink and shift from seeing the world as one person does to how another does. Parkour and freerunning are disciplines of movement that can be visualized as urban gymnastics. A Parkour practitioner’s intention is to move from Point A to Point B as quickly and efficiently as possible over, under and through any obstacles in his or her path. A freerunner takes this intention and builds on it with style, flips, and flare. PKFR, to which it is collectively referred, consistently evolves the canon of its art form through influences of every type of diverse movement from dance to martial arts to skateboarding and climbing. The result is an explosively dynamic art that has been increasingly captivating audiences through every channel of media and live performance over the past three decades. PKFR is prominent now on YouTube and in Hollywood (i.e. American Ninja Warrior, Casino Royale, Arrow, Daredevil, even robot Parkour in Transformers) but still has a limited presence in live performance. In 2012, our Parkour Play was not the first time that PKFR had shown up on a stage (even we had been running live performances for years) but it was the first time that Parkour and its ethic of community, inclusion, and respect of others and one’s environment had been used as the key motivation and expression of a plot. The play is focused on mental health, specifically Alzheimer’s and dementia, Autism and Asperger’s, and Rubinstein-Taybi Syndrome. The plot was inspired in equal parts by the death of Steve Nagy’s grandfather and Artistic Director, Zoë Klintberg’s, grandmother—both of whom battled Alzheimer’s—as well as a Parkour community member (Chad) whose younger brother has RTS but whom, through years of playing Parkour-based games together, has learned to walk, run, cartwheel, climb and embrace an expanded outlook on life. The linchpin in bringing all of these elements together was that each monumental figure existed in their strongest forms when they were living in their imaginations. In her final years, Zoë’s Gram replayed, in reverse, the adventurous story of her love for her husband. In their final conversation, Steve’s Grumps was desperately searching his WWII naval ship to find his wife who had been stolen from him by an evil man. And Chad’s younger brother somehow increases his abilities every time Chad refers to his brother’s favourite superhero, Buzz Lightyear. 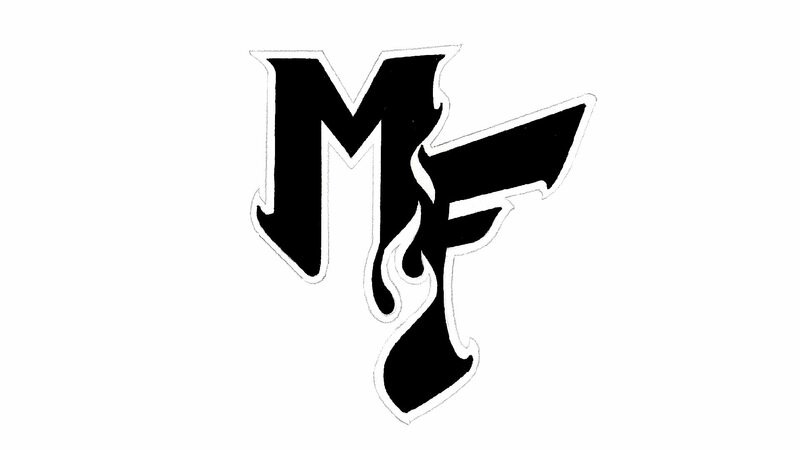 It was for these reasons that we called the play, MindFire. Due to the timelines of the GiGYYC grant, we took the play from inception to production in approximately 6 weeks. 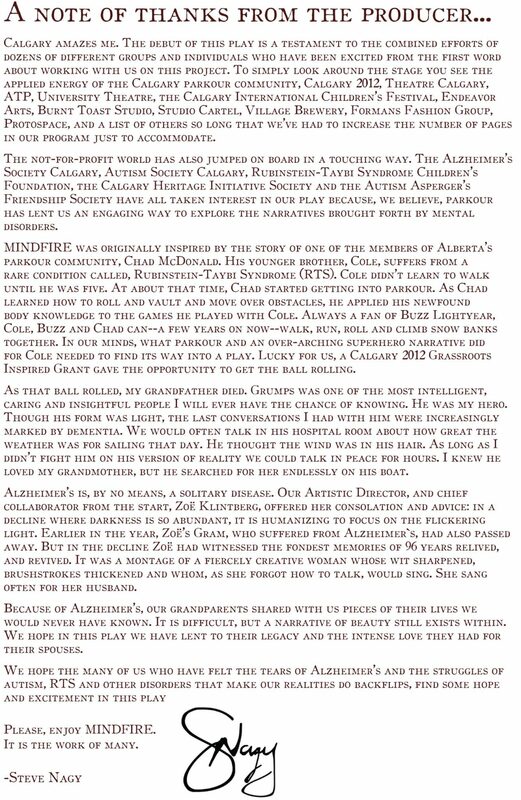 In that period, over 30 community partners banded together to make the play possible including the Autism Asperger’s Friendship Society, Alzheimer’s Society Calgary, and the Rubinstein-Taybi Syndrome Children’s Foundation. We performed to over-capacity audiences at each showing and the momentum created by MindFire launched the creation of our company, Rocket House Productions, and positioned Steve’s other company, Breathe Parkour, to expand and open its first gym. RocketHouse has now been operating for four years as an adventure theatre producer providing corporate team building, performances, and wearable technology development. Breathe Parkour has expanded to three training facilities, school programs, and the world’s fourth most read PKFR blog.